Buckeye Chuck, Ohio’s official weather-forecasting groundhog, called for six more weeks of winter during his annual Groundhog Day forecast on Friday at radio station WMRN-AM in Marion. It’s the third consecutive year that Chuck has predicted an extended period of wintry weather. Parts of the U.S. are in for six more weeks of winter, according to weather-predicting groundhogs in Ohio, Pennsylvania, and Georgia. Ohio’s Buckeye Chuck, Pennsylvania’s world famous Punxsutawney Phil, and Georgia’s Gen. Beauregard Lee each saw their shadow early on Groundhog Day 2018, meaning, according to legend, that winter weather hang on for an additional six weeks. The spring equinox will occur on Tuesday, March 20 this year, which is four days beyond the projected six-week window. With temperatures in single digits, the crowd that gathered in Marion to hear Buckeye Chuck’s forecast groaned when his handlers at radio station WMRN-AM announced his prediction of more winter at 7:41 a.m. Friday. 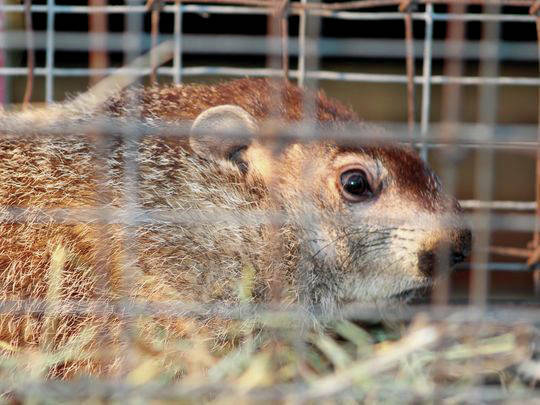 This marks the third consecutive year that Buckeye Chuck has predicted six more weeks of winter. The Marion-based whistlepig called for an early spring from 2010 to 2015. Chuck and the crew at WMRN-AM have been offering weather forecasts on Groundhog Day since the 1970s. The Ohio General Assembly declared Buckeye Chuck the state’s official groundhog in 1979. The official Buckeye Chuck Facebook page states that his forecasts have been correct 75 percent of the time. On Gobbler’s Knob in Punxsutawney, Phil’s “Inner Circle” — garbed in top hats and tuxedos — announced his prediction at 7:25 a.m. Friday. Groans were also reported from the crowd that assembled in the western Pennsylvania hamlet for the 132nd year to hear from Phil. The first Groundhog Day observance in Punxsutawney was in 1886. Down in Georgia, Gen. Beauregard Lee, the South’s weather-forecasting whistlepig, also predicted six more weeks of winter. The General is headquartered at the Dauset Trails Nature Preserve in Jackson, Georgia, just south of Atlanta. The origin of Groundhog Day can be traced to Candlemas, the ancient European celebration of the midway point between the winter solstice and the spring equinox. According to the tradition, fair weather on the day of Candlemas meant a stormy and cold second half of winter was in store.